Way back when, in the days of t-squares, triangles, waxing machines and lots of bloody X-acto cuts, I met my first Mac. The year was 1987. I was a design student at the University of Maryland. I had a paid internship in the university’s publications department where I spent the next six years. And this is where I met the Mac Plus. 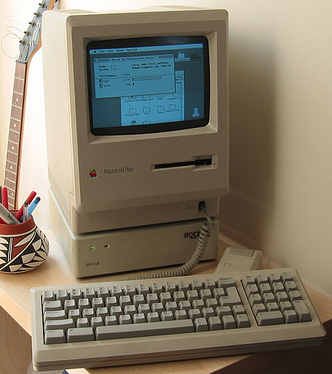 Introduced in 1986, the Mac Plus was the third in its line and cost a whopping $2499. It had a 9-inch monochrome display and a resolution of only 512×342 pixels. Typography was still fairly crude but far better than what the PCs in the school’s lab could do. In our design program, there was one lab with a few PCs and crude paint software. And yet, to draw a squiggle on the screen felt like magic. Not many students took interest in these computers. Our projects required clean typography. One way to do that was to trace by hand and paint with gouache. Yes, we actually hand-painted our type, mainly headlines, but if you were insane enough, small type as well. I was insane and also poor. Students who were bankrolled by parents could afford INTs — a type of transfer like a custom Letraset. We gouache types felt superior in our willingness to hand-craft our type, but really we were just jealous. And yet, even though this was painfully slow, we knew we were developing an intimacy with letterforms, drawing and spacing them just so — a skill that comes in handy even now because out-of-the-box type often requires some manipulation. I digress, but it’s important to put this into context. For one thing, phones were still largely connected to walls (younger readers take note). There was no free music on the internet. There was no internet, at least for common folk. I had never seen a Mac and I’m not sure I had heard of one. I don’t recall why but I understood that this computer was cool. Probably because our boss would allow only certain of us to touch it. It sat unused much of the time because A) is was very small and hard to do a newsletter layout with it, and B) we weren’t yet able to output camera-ready layouts. We still hand-specified our manuscripts, sent them to a typesetter and used cave-man like tools to put a layout together. There was also no such thing as halftones on the computer. In fact, it would take a few versions of the Mac before we stopped making halftones in a dark room (oh, the drudgery) to mash up with our computer-created layouts. Back then, we knew we were a little slow to adopt all the technology. Our new boss was resistant to the computer and discouraged us from using it fully, much to our annoyance. Steve Jobs’ story of how typography came to the Mac is well-known. But for those who don’t know, he had taken a random calligraphy class at Reed College because he had seen beautifully done posters around campus. He spent hours learning about letter and word spacing, thinking he was just killing time and having a creative outlet. Steve also said he wanted to put a “ding in the universe.”He certainly did that. And he also put a ding in people’s hearts. yes…lights (and screens) are a little dimmer today…and yet I feel a strange desire to run out and get an ipad. I just bought an iPhone yesterday before I heard the news. Serendipity.